If you use Events in your Jackrabbit database, you may display these Events on your website to allow online registration and enrollment. Events are displayed in a calendar format on your website page. Events can be set to Family or Student enrollment, can have fees posted, can gather custom questions/answers, and can have their own legal policies per Event Type. The set- up of Events is covered in depth in the How To Guide section called Events. Please reference that section to set up your Events before proceeding below. This section only deals with using/displaying your Events online. Open: Means the max size has not been reached and enrollment is still available. These will display in the color assigned and will be a live link to your Event Registration form. Unavailable: Means that particular day/time is reserved or not available for enrollment. These will display in beige and will be a live link to an Event Registration form that indicates the date is reserved and no enrollment can be made. Booked: Means the max size has been reached and no further enrollments are allowed. You may show these or hide these on your main website calendar. Hold: Means your staff is holding the date for some reason and enrollment is not allowed. These do not show on the default online calendar. Notice: Displays as text only and can be used to note Closed dates, payment due dates, and other general announcements. These will display in the assigned color on the online calendar. 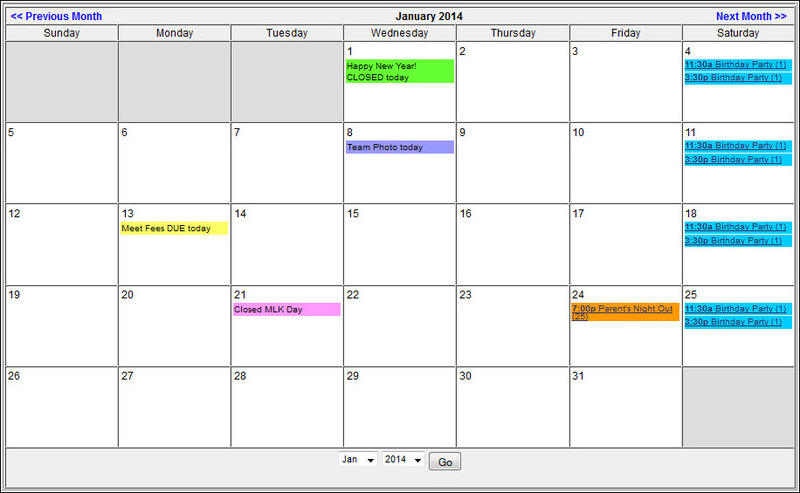 You can assign each Event Type a color code on its Summary page (look for the crayons). Events that are Status of Open or Notice will show in the assigned color on your calendar. The Status of Unavailable and Booked (if you are showing Booked) appears as beige.